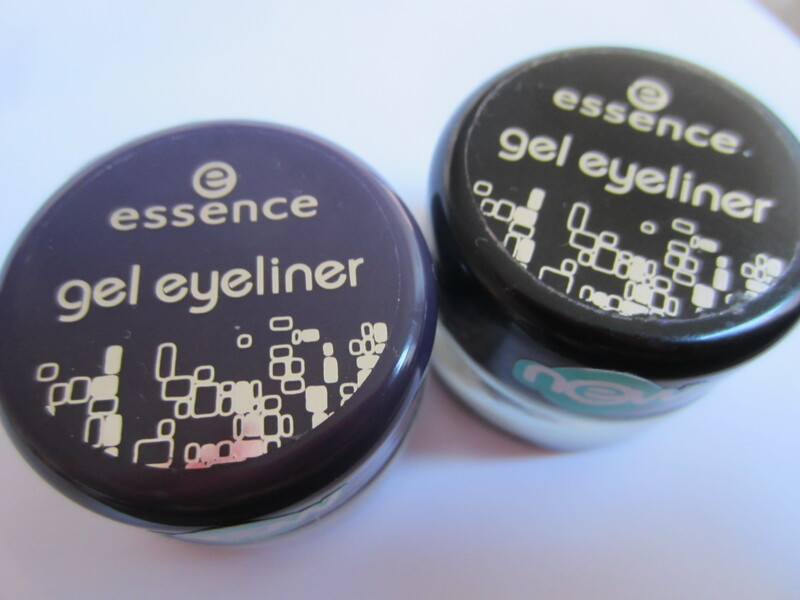 Essence Gel Eye Liner Review!! This post is long overdue. Essence is a brand that can be found at Ulta that is on the cheaper side. Actually, Essence is around the same price point as Wet ‘n Wild. Essence seems to have a younger personality than other makeup brands on the market and seems to be packaged and branded more towards the tween girl getting into makeup. But a lot of makeup bloggers and youtube gurus are giving this brand some much deserved attention. I always glanced over the makeup portion of the Essence display when I was at Ulta but always gave the nail polish attention. Essence nail polish is less than a dollar and are like little mini bottles that are packed with some pretty cool colors and I have featured Essence nail polish on this blog before. To see that beauty of a polish, you can go here to see a light duochrome shade. I first came across the gel eyeliners from Essence about 6 months ago when I was browsing through the Essence display, again looking at the nail polishes. I am a little embarrassed to admit this, but at the time that I bought the Essence gel liner I had never tried a gel liner before! I had always stuck to my tried and true liquid liner. I still prefer liquid to gel, mostly because I can apply liquid much faster and its a lot crisper, but when I saw that Essence had gel liner I decided to give it a try. Like I said, I had never tried gel liner before. Mostly because I had liquid liner and pencil liners and gel was designed to be the middle ground. What I had heard from makeup artists was that gel was the stepping stone to get into liquid. Gel liner is supposed to be easier to work with, less messy and allows for more control so there are less mistakes. Since I was always told that people use gel because they have difficulty using liquid, I never bothered picking up a gel liner because I had mastered the application of liquid liner. Again, I still prefer liquid liner because it is faster, easier and doesn’t require me to clean a brush, and I’m lazy at 6:30 am when I’m doing my makeup. So when I finally decided that I wanted to check out gel liner I knew I would be looking into the less expensive brands. That seems like makeup common sense, if you don’t know if you’re going to like a new type of product then buy the cheapest version of that product and experiment. If you don’t know you’ll love wearing a red lip but want to give it a try, buy the $1 Wet ‘n Wild red lipstick instead of the $30 red lipstick from Sephora. That’s how I felt about gel liner, I didn’t know if I would like the consistency or if I would have trouble with the application, so I didn’t want to invest in a Mac Fluid Line. So when I saw Essence had a gel liner that was only $3 that had a brush right next to it for $1 I bit the bullet and gave it a chance. That decision was 6 months ago and I had some trouble getting into the application in the beginning but I have since found an easier brush to apply gel liner and my Essence gel liners are getting a whole lot of use. The last time I checked my Ulta, Essence only had 3 gel liners: black, brown and purple, and although those are the colors, they are named after cities. 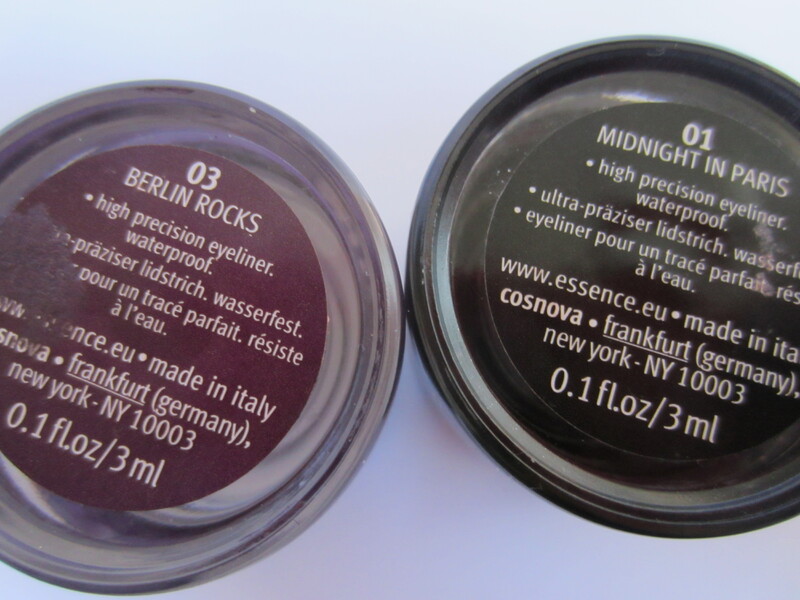 The black is called “Midnight in Paris” and the purple is “Berlin Rocks.” If I remember right the brown has something to do with London, but I haven’t yet purchased that one. I first picked up the black, which seemed like a more obvious choice to experiment with as a new-be, and later picked up the purple. And again, I can’t reiterate enough that $3 for .1 oz of product is amazing, considering a MAC gel liner is the size but $15. The consistency of these are a little bit more on the soft side for gel liner. I now have a few different brands of gel liner and Essence still is the softest, and maybe the most wet, of all the brands I’ve tried. It is extremely easy to pick up color and a little goes a long way. 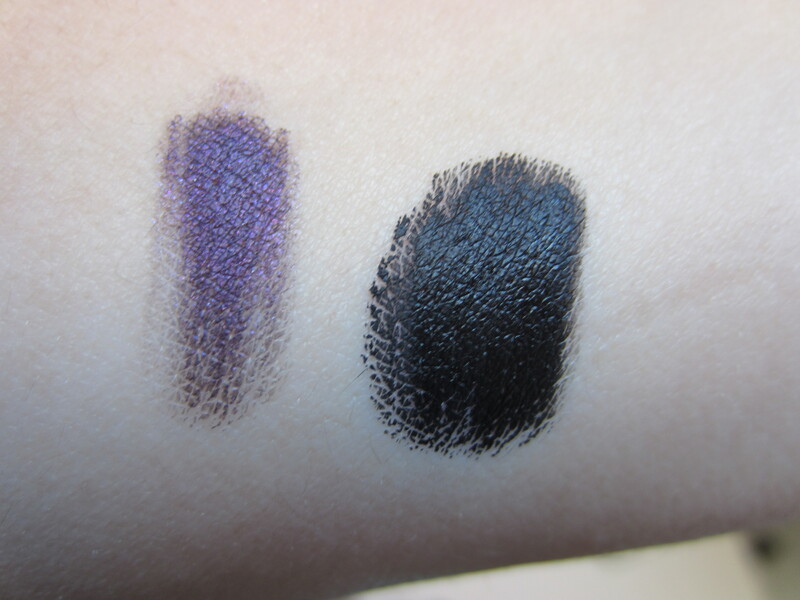 As you can see, the black is extremely pigmented and although you can’t see me actually swatching it, I didn’t take use that much to create that dark of a swatch. The purple is definite a bright purple and gives fun pop of color, but isn’t as pigmented as the black. I have also used both of these as color bases for eyeshadows to really darken up a look and they don’t crease or smudge. Essence also claims to be waterproof and I can comment and say that they aren’t as waterproof as some products I’ve used but they definitely are water proof and smudge proof and I have had some trouble getting these off without a makeup remover. Overall, these are amazing gel liners for the price. They are $3 that are waterproof and smudgeproof and have amazing last power, and my MAC gel liner is the same size and in my opinion doesn’t have as great of lasting powder and is 5 times more expensive. The only thing I’ve noticed is that after about 6 hours of wear I have a little bit of smudging around the outer corner of my eye from natural tearing and crinkling due to blinking and smiling. But in my opinion, that’s something to just expect from almost any liner unless you are using an eyeliner that resembles a sharpy marker. I wish Essence would release more colors than just 3 because I would buy them all. These were my stepping stone to get into more expensive gel liners but these are still my go to. I use my Essence gel liner more than I use my MAC gel liner, and that’s saying something! The Look for Less! Dupe Alert?